Replacing a 200-page novel with a PDF file will cost a grand total of $2. 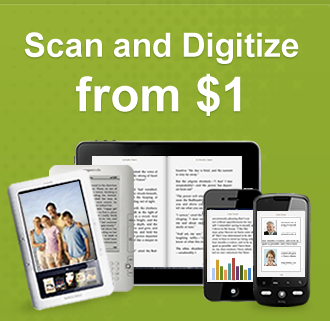 The idea behind 1dollarscan.com is simple: why not take all those old paper books or documents that are cluttering up your home, and send them to the firm’s offices in San Jose, where they’ll be scanned and turned into searchable PDF files? Rates start at $1 for 1-100 pages, which means that replacing a 200-page novel with a PDF file will cost a grand total of two bucks. It’s a lot cheaper than buying a replacement on Amazon, that’s for sure — and that’s if the book you are replacing is even available as an electronic file. Indeed BOOKSCAN’s almost instant success in Japan was a business dream come true, and part of that was due to an influential IT blogger raving about the service on his site, which says Nakano, had a “huge impact.” Soon the firm had a four month backlog of people demanding to use services, and — perhaps the greatest measure of success — 100 competitors who had sprung up almost over night, like mushrooms after rain. But while an influential endorsement can create buzz, it doesn’t sustain a business long term. So who are 1dollarscan’s customers, individuals or institutions? Following a period in Japan when demand was so huge that users might have to wait four months before receiving their scans, the average wait is now down to two months, while platinum membership guarantees a PDF will be in your inbox within 5-10 days. Currently in the US, all customers enjoy a platinum-style service, as all scans are guaranteed to be done within 10 business days. Nakano stresses that the service complies with all copyright laws; scanning services are provided under the condition of Fair Use and all customers have to agree with the Terms and Conditions to use the scanning services. In addition to scanning books, 1dollarscan also scans documents, business cards, photo albums — if it’s paper they’ll scan it. For instance, says Nakano: “We are getting quite a lot of orders for old high school yearbooks. DISCUSS: Have the Ethics of Book Scanning Changed?